For a trifle o cash, it was my intent. I marched in fu stately an throwed the dud doun. Born in the village of Conlig, he was the son of John Sloan (1789-1853) and Mary Lennox (1794-Unknown) of Conlig, County Down, Ireland. His father’s first wife died, possibly in childbirth of her third child. Only one of his half siblings is known to have reached adulthood and died in England. Little is known of his older full brother, Samuel Lennox Sloan, Isabella’s grandfather’s cousin. Edward was married on 14 April 1853 at Bangor, County Down, Ireland to Mary Elizabeth Wallace, also of Conlig. Their first 6 children were born there, two of them dying before the family emigrated to America in 1863. Their last 5 were born in Utah. In 1865 he married by plural choice, Phoebe Louisa Watts (2 children) & in 1866, Emma Jones (3 Children). His family suffered the loss of many. My two grannies were sisters, so that Edward was “Uncle Ned” to both. Martha (1879-1946) was the eldest, Isabella (1896-1983) the ninth child. Their father was Alexander Sloan (1853-1913) , who married, at the age of of 25, Jane Gamble (1858-1937). In Conlig at this time there were three predominent families the Sloans, the Gambles and the Montgomerys. These three families underpinned the community and intermarriage between them resulted in every one being related to everyone else in some way or other. Uncle Ned was trained as a weaver. At some point in his teens, he joined the LDS Church. He was ordained an Elder in the church at age 18 and then served as a missionary throughout the British Isles. In 1854 he published a volume of poetry he had written entitled The Bard’s Offering. In 1851, Edward had married Mary Wallace, who was also a native of Conlig. After having served as editor of the Millennial Star, with his young family, he emigrated to Utah Territory in 1863. They crossed the ocean on the Amazon on which he served as the first counselor in the presidency over the Latter-day Saints on board. In Utah, Edward was the founder of the Salt Lake Daily Herald in 1870, which he ran with W,C. Dunbar. When his efforts to get a column on women’s issues included in the Herald were defeated by Dunbar, Edward went ahead and organized the Women’s Exponent with Lula Greene as editor. 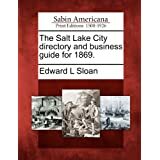 Edward also published the first City Directory of Salt Lake City. In his famous directory, Edward reported that on January 10, 1870, the Utah Central Railroad was complete to Salt Lake City, its southern terminus. In spite of inclement weather, a huge crowd assembled to hear speeches and witness the ceremonies. The last spike, made of Utah iron, was driven by Brigham Young. This railroad was an immediate success. Most of the mining, manufacturing and trade of the territory was concentrated in Salt Lake Valley, and this connection with the main line of America’s greatest railway, the Union Pacific, at Ogden was vital. Two days after completion, the first carload of ore was shipped over the line. Edward also served as secretary of the Deseret Sunday School Union at the time of its organization in 1872.Prior to the founding of the Herald, he had assisted George Q. Cannon in editing the Deseret News. He was also the recorder of many of the discourses included in the Journal of Discourse. Trully Uncle Ned was a great man of the early American West. But he was also one of the last of the Rhyming Weavers and the inspiration of my interest in Ulster Scots, as well as the poet John Hewitt. In 1978,and again in 1980, I visited the Fryske Akademy in the Netherlands with a group of Ulster politicians and community activists to see how Ulster Scots, which he described as Ulster Lallans, could be promoted in the same way as Frisian. As a result of this, I published in 1981 Amy vision for the future of Ulster Scots and Ulster Gaelic in a paper The Language of Ulster, which formed part of my book the Identity of Ulster. Throughout the 1980s I promoted both languages in lectures to community groups throughout Northern Ireland, as a result of which I was asked to become a founder member of the Cultural Traditions Group of the Northern Ireland Community Relations Council in 1988. In 1990 I helped found the Ultach Trust for the preservation and promotion of Ulster Gaelic.On 23rd July 1992 I had the first of several meetings with Professor Robert Gregg in Vancouver to discuss the development of the Ulster Scots language on a cross community basis in both Northern Ireland and Donegal, in which I proposed to Professor Gregg the formation of an Ullans or Ulster Scots Academy promote both Ulster Scots and Ulster Gaelic. That year I published under the imprint of his publishing house Pretani Press, The Folk Poets of Ulster series: the three volumes of The Country Rhymes of Hugh Porter, the Bard of Moneyslane; The Country Rhymes of James Orr, the Bard of Ballycarry and The Country Rhymes of Samuel Thompson, the Bard of Carngranny, and as a result was asked to become Chairman of the newly formed Ulster Scots Language Society. This society was formed to encourage an interest in traditional Ulster Scots literature, whether it be prose, poetry or drama, to support the use of the Ulster Scots language in present day speech, in education and to encourage the Ulster Scots tradition in music, song, dance, ballads and story telling.The Ulster Scots Language Society produced its first magazine Ullans in 1993. I proposed the title “Ullans” as a contraction of the words Ulster (Gaelic Ulaidh) Lallans, the latter being the Scotch word for Lowlands or the Lowland speech. Ullans was also considered as an acronym of the purpose of the Ulster Scots Language Society to support the Ulster Scots Language in Literature and Native Speech or as the developing literary standard of the Ulster Scots Language. At my request, a letter from the Chief Executive of Belfast City Council was forwarded on 4th October 1994 to Professor Robert Gregg, at that time the greatest living authority on Ulster Scots, in order to establish whether Ulster Scots was in fact a distinct language or merely a dialect of English. Professor Gregg replied on 17th November 1994 that Ulster Scots was decidedly a distinct language and in no way a garbled dialect of English. Since then I have tried to stay to the forefront in promoting his concept of an Ulster Scots or Ullans Academy based on the Frisian or Fryske Akademy in the Netherlands, using a broad narrative of origins, rather than starting with the Plantation Settlements of the Seventeenth Century.